Spring is in the air, and we have just the thing to help ring in the new season. 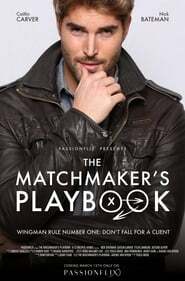 Open up those blinds, pour yourself a glass of lemonade, and enjoy one of the freshest, funniest, most buzzworthy, new romantic comedies: “The Matchmaker’s Playbook.” What was once a Passionflix exclusive is now available on Amazon. Accessing non-stop love and laughter has never been easier! Boasting an impressive 9.2/10 rating on IMDb, “The Matchmaker’s Playbook” offers flirtatious fun and heartwarming moments guaranteed to leave you smiling. Whether you watch with a group of girlfriends, a significant other, or just for a nice, mellow night for one’s self, “The Matchmaker’s Playbook” is a sweet, laugh-out-loud flick perfect for any occasion. Directed by Tosca Musk and adapted for the screen by Joany Kane, “The Matchmaker’s Playbook” centers around the playful and steamy relationship between cocky-but-loveable former NFL player Ian Hunter (social media star and certified hunk Nick Bateman) and his dating service client turned love interest Blake (Caitlin Carver from the award-winning I, Tonya).